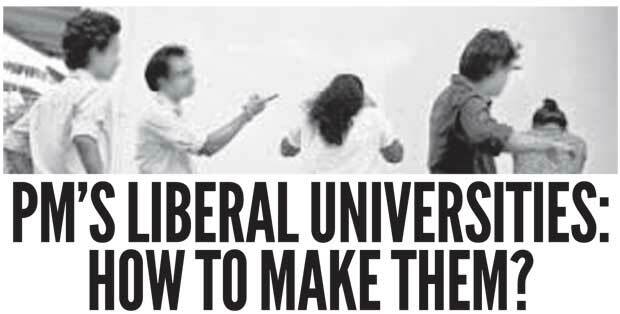 Daily Mirror - PM’s liberal universities: How to make them? PM’s liberal universities: How to make them? rime Minister Ranil Wickremesinghe has called for creating a liberal culture in our universities. A noble goal, indeed. Still better if he advocates a liberal society at large in this country. That would be much easier since his government has at its disposal a parliamentary majority to make laws and policy and to revoke discriminatory laws that put the vulnerable communities at harm. He can abolish those antiquated laws such as Penal Code Article 365 A, and launch a public advocacy against all evils such as xenophobia, bigotry and homophobia. Perhaps, doing that would be much easier than reforming universities where the rot runs deeper. Still, reforming university culture is worth a shot, though a long shot, it is . A liberal society worth trying creating, it should feel more acceptable to minorities than a Dharmista society the late President J.R. Jayawardene pledged to create, since the latter, inadvertently contained a religious invocation that might have alienated followers of other faiths. They say a liberal polity needs tolerance and respect for individual freedoms, which would be its corner stone. But, there is another prerequisite. A liberal society is possible only as long as the murderers are jailed, thieves are locked up, psychopaths are kept on medication and other delinquents have their freedom of action seriously contained. All the above are the responsibilities of the government which wields the monopoly of legitimate violence. It has to enforce the laws through its organs, no matter the circumstances and the context. After all, modern governments are ruled by laws, not by men. When the government derelicts that duty, it takes away the deterrent that keeps a check on less salubrious individuals among us, and in any society, there is a plenty of them. Even the most ardent of the optimists of the human nature can not vouch, if laws are suspended, our societies would not derange into an apocalyptic frenzy as depicted in that 2013 social science fiction horror thriller “ the Purge”. "After all, it is shame that after billions of rupees of tax money, the best of our youth are condemned to be unwilling slaves of an antiqued ideology without even knowing the monstrosity it unleashed on the mankind"
If the sexual, physical, or emotional harassment of an individual is a crime punishable by law in the country at large, so should it be no matter it happened within the confines of academia. However, those primitive violence that take place in universities, until now, have not been taken up by the courts, because the universities don’t report them. The whole idea of laws and punitive sanctions as a deterrent to crime is relegated to paper, when they are not enforced. And the perpetrators are emboldened, and that is why, contrary to all the good intentions, ragging is flourishing. The government should reinforce those deterrents. It can make it is required by the law for universities to report all ragging related incidents to the police, which can then investigate and file charges against the perpetrators. The Justice Ministry should consider increasing penalties for ragging, including jail sentences. It is always good to conduct public advocacy in universities against ragging, however, such efforts were (and are being) taken in the past and the present, with very limited success. Morality lessons alone do not deter an individual from violating them, but a strong deterrent in terms of punitive sanctions does the trick. Then there is this other fallacy. They say the troubles in our universities are a reflection of imperfection in our society; that the frustration there is vented out through those primitive practices. That is a self-indulgent lie. In fact, as the Premier pointed out, politics in our part of the world, South Asia, is alive and transformative (no matter its imperfections), however the university politics smacks of North Korea. The problem lies at the core of this monopolistic political ideology, some arcane form of communism or of the hard left that is dominant in our universities. Even in India’s famed Jawaharlal Nehru University, a leftist bastion that is now at the heart of a freedom of expression debate, the lefties there have historically cracked down on other forms of political expressions. There is one hard fact: For communists, Islamists and terrorists, the niceties of fundamental freedoms, including freedom of expression, is just a mere stratagem to reach their ends. When they reach there, or cement their hold, they have historically denied those freedoms to others. There was a time in our universities when student unions affiliated to all political parties could freely contest student council elections and win a representation. When the JVP affiliated unions cemented their control in universities, they, in true communist style, dismantled that pluralistic tradition. Now the President of the country or the PM or for that matter any leader of a mainstream political party cannot visit a university and deliver a speech, without the event being sabotaged. But, the members of that Front Line Socialist Party with which the Inter University Student Federation is affiliated and slavishly worshipped by the student activists could do as they wish. The government should recreate that pluralistic environment in the past in our universities. To do that all major political parties should consider establishing branches in universities and demand that the university administration provide a conducive environment for a pluralistic debate and that those who stand on those fundamental values be handed over to the law enforcement agencies. After all, it is shame that after billions of rupees of tax money, the best of our youth are condemned to be unwilling slaves of an antiqued ideology without even knowing the monstrosity it unleashed on the mankind. The government can change that miserable status quo only by creating a liberal space, in which fresh air will blow in and sweep away the rotten garbage now considered as the received wisdom in university politics.